Adobe Edge Animate CC enables you to add Stage triggers — essentially commands that control how the animation plays. To add Stage triggers, you have to perform a number of steps in a certain order. The following procedure shows how to add a loop to your animation through a Stage trigger. 1Create an animation sequence to which you can add the Stage trigger. For example, draw an element on the Stage using the drawing tools and then create an animation sequence. 2Position the Playhead on the Timeline where you want the Stage trigger to fire. You could, for example, set a trigger at the end of the animation. 3Click the Insert Trigger icon as identified in this figure. 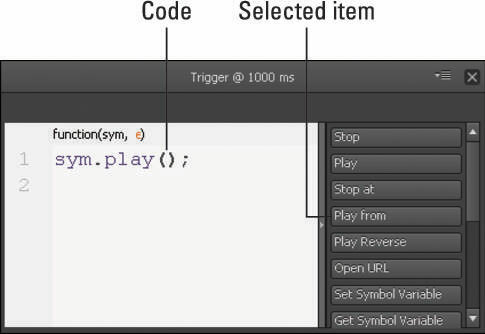 When you click the Insert Trigger icon, the Trigger menu opens (refer to the figure). 4With the menu open, click a trigger item on the right, for a loop, choose Play from. Doing so inserts code into the window on the left (see this figure). 5Click the X in the top-right corner of the Trigger box to close and save your trigger. You see a Trigger icon in the Timeline, as identified in this figure. To see your loop in action, you need to preview it in a browser. 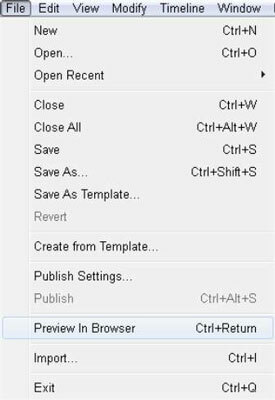 To preview your animation in a browser, from the main menu, click File and then Preview in a Browser (see this figure). Congratulations! You now have a loop within your animation. You can add a label or designate a time in the Trigger box if you want your animation to loop back to a certain point in the Timeline instead of returning to the beginning.